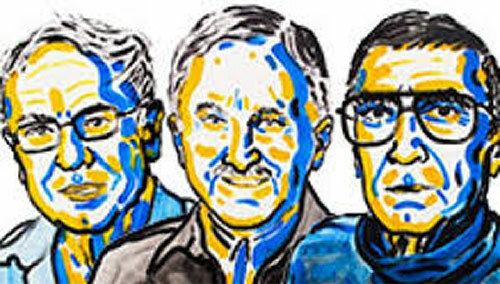 Recipients of the Nobel Prize in Chemistry were announced today acknowledging three scientists that made fundamental contributions to the study of how cells repair DNA and maintain genomic integrity. Each day our DNA is damaged by UV radiation, free radicals, and other carcinogenic substances. However, even without such external attacks, a DNA molecule within the cell is inherently unstable. Thousands of spontaneous changes to a cells genome occur on a daily basis and defects can arise when DNA is copied during cell division, a process that occurs several million times every day in the human body. The reason our genetic material does not disintegrate into complete chemical chaos is that a host of molecular systems continuously monitor and repair DNA.Most cells use three main pathways to repair damage incurred to genetic material. Thomas Lindahl, Ph.D., emeritus scientist at the Francis Crick Institute in London, was recognized for his discoveries in base excision repair-the pathway that constitutes the bulk of DNA restoration during the cell cycle from alkylation, methylation, and oxidative stress. In the early 1970s, many scientists believed that DNA was an extremely stable molecule, but Dr. Lindahl demonstrated that DNA decays at a rate that ought to have made the development of life on Earth impossible. This insight led him to discover the base excision repair mechanisms. Paul Modrich, Ph.D., investigator at the Howard Hughes Medical Institute and professor of biochemistry Duke University School of Medicine, was honored for uncovering how cells resolve errors that occur during DNA replication. This so called mismatch repair pathway rectifies base-pairing errors within DNA and defects within this molecular machinery has been shown to increase genomic mutations up to 1,000-fold. Moreover, mismatch repair errors are the cause of the most common form of hereditary colon cancer (HNPCC) and are believed to contribute to the development of a subset of sporadic tumors that occur in a variety of tissues. Aziz Sancar, M.D., Ph.D., professor of biochemistry and biophysics at the University of North Carolina School of Medicine, was acknowledged for his seminal work on the nucleotide excision repair pathway. Cells use this pathway to repair UV damage to DNA. Individuals born with defects in this repair system will develop skin cancer when exposed to sunlight. Additionally, the cell also utilizes nucleotide excision repair to correct defects caused by mutagenic substances and DNA lesions that create aberrant bulky regions within the helical strand. These scientists have provided the essential insights into how cells function and maintain their genomic stability-knowledge that integral for the development of new cancer treatments.